Many years ago I worked in a bar in Piazza Matteotti, right in the centre of the Umbrian town of Citta di Castello. Flanking one side of the Piazza there was (and still is) a large building with three clock faces. Two of them sit side by side; one indicating the hour and the other the minutes, and perched above and in between the two lower clocks is a third which has, to the uninitiated, a rather puzzling series of letters around the perimeter. These letters, I soon discovered, indicated the wind direction and was a sort of two dimentional weather vane. 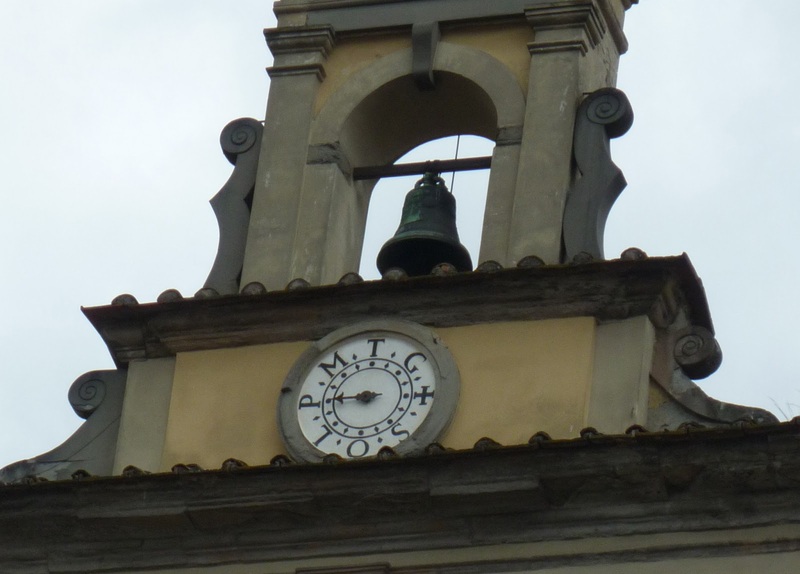 Though most people grasped that the lower clocks indicated the time, I lost count of the amount of tourists, both foreign and domestic, who asked me what the letters on the top clock represented. To begin with I would scuttle off and ask a friendly regular to remind me of those that I had forgotten but eventually I learned them off by heart which wasn’t easy; my Italian wasn’t great then and most of the words were totally unfamiliar to me and as a consequence, much more difficult to remember. Mind you, gazing up at the clock did help! The bar is sadly no longer there though there are other bars in the square so should you happen to be in Città di Castello, eating an ice-cream or sipping a coffee/aperativo with family and/or friends, you will undoubtedly impress them no end if you can tell them what the clock indicates and what the letters mean. Tramontana, Grecale, Levante, Scirocco, Ostro, Libeccio, Ponente and Maestrale. And if you can learn to pronounce all of those words correctly the rest of the Italian language will be a doddle! Until I took the above photograph the other day I had rarely (if at all) seen any other type of wind but the chilly Tramontana in the winter and the hot, dry Scirocco in the Summer. Maybe the dial was stuck or something; who knows! Anyway, show-off if you ever have the chance. Trust me, people will be impressed! If you are house hunting and decide that Città di Castello is the place for you then Abode have a selection of properties in and around the town. For example Casceri is a recently restored top floor apartment with a roof terrace, two bedrooms and a funky interior. Bear in mind that a roof terrace means stairs, so if you prefer to be nearer to ground level but still require an outside space, then you may need to consider a town house with a garden. Casa Giardino is one such property and is a rare commodity as there are probably only 30 or so in Città di Castello. This ‘L’ shaped, low level house has direct access to the garden from both the living and sleeping areas. It’s very pretty! Finally, Casa Secondo is ten minutes from Città di Castello in the amenity rich village of San Secondo. The property comprises a restored rural building and annex. It is literally steps away from the shops,bars and the railway station and again, has a garden. If you require further information please don’t hesitate to get in touch with us; we want to sell you a property! For over a century the Venice Biennale has been one of the most prestigious cultural institutions in the world. Since its foundation in 1895 it has promoted new artistic trends and organized international events in contemporary arts. Events includes the Film Festival, the Art and Architecture Exhibitions, the Festival of Contemporary Music, the Theatre Festival and the relatively recent Festival of Contemporary Dance. The Biennale has remained an indisputable artistic focal point through the last century and up to the present day. Initiated on April 19th 1893, as part of the municipality of Venice’s contribution to the silver anniversary of the marriage of King Umberto I and Queen Margherita of Savoy, the city proposed to hold a national biennale. Additionally, this exhibition coincided with the celebrations of the newly formed Italian state. Shortly after its establishment the structure of the exhibition was reorganized from a national exhibition to an international event. The layout of the exhibition in the 20th century was characteristic of how the space was used as it was influenced by the Salon exhibition styles in Paris. The Biennale was set up with a central exhibition building consisting of connected galleries of international and national themed rooms. Gradually the character of the exhibition changed with stronger emphasis on national identity in later Biennales. The 55th Biennale opened on June the 1st and roughly 300,000 visitors are expected before the pavilions are closed on the 24th of November. There are a record number of 88 national pavilions taking part in the festival this year with shows from 88 countries, more than ten of whom, including the Vatican and the Bahamas, are participating for the first time. Works are shown in the national pavilions in Venice's Giardini and in the city's former arsenal, as well as in palazzi and churches spread around the islands of the lagoon.